We mourn the loss of the Rev. 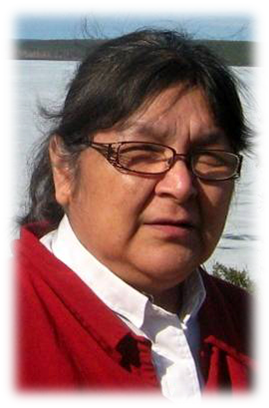 Verna Fleming Jebb of Opaskwayak Cree Nation who passed away March 15, 2014. Here is Verna’s biography as it was printed in her funeral bulletin. Verna was a wonderful friend and colleague. We miss her presence among us. Verna was born Wednesday, July 22, 1953 at Moose Lake, Manitoba to Douglas & Flora Buck. As a young child she lived with numerous relatives and her grandparents. Verna was accustomed to both the Anglican and Roman Catholic Services. At the age of 11, she moved to OCN-The Pas with her foster parents, the late Jim and Hilda Young. As a young girl Verna use to clean the Church of Messiah on OCN. During her cleaning sessions, she would often go to the pulpit and slam her fist and pretend to preach. Verna met Michael at one of his sister’s wedding dance. Verna had a very compassionate heart . During this night Michael’s date had stood him up so Verna being the caring person, felt compassion for Michael and agreed to be his date. From this point it was a match made in Heaven as it lasted for the next 40 years. Early in their marriage, Verna began to concentrate on church activities. She volunteered to be a lay reader, choir member, vestry and Sunday School Teacher. These were the times that Verna really enjoyed. Sharing the Love of God with others. Verna had various short careers. None of these careers satisfied her life. Verna then attended Henry Budd College. Bishop John Conlin started this college. Verna also attended Cook Christian School in Arizona, USA. From there she also attended Vancouver School of Theology, Westcott College, in Cambridge, England. Verna loved Gospel Music and attended many jamborees. She loved to encourage others to sing, take part, and praise. She travelled to places like Sachigo, Kingfisher, Sioux Look Out, Ontario, Gillam, Fox Lake and all the local communities in this area. One of Verna’s special missions was to go to the Fiji Islands, to be a representative for the Anglican Mission. At this mission, she was very well respected by the local Fiji people. It was thought this was due to her native ancestry but we know it was her loving aura. Verna worked at Rosaire House and the last place of work was at The Pas Correctional Institute. At the same time, Verna continued to be available for her ministry to others. Verna had difficulty refusing to assist others. Even though her health was declining, Verna was determined to continue her work. Verna passed away peacefully with her family by her side, Saturday, March 15, 2014 at the Winnipeg Health Sciences Centre, at the age of 60 years. Our mom leaves to mourn our dad Michael John Jebb; her son Michael Jr known as Mikoots (Lorette) Jebb; her daughters Rema (Phillip) Head, Tanya (Jerry-Ron) Campbell, Ronalda (William) Grey, and Evelyn (Harvey) Scott. She will be missed by all her grandchildren Gordon, Saul, Gary-Lynn, Antonio, Verna Jr, Lovely, Norman, Ryan, Christie, Jerrie-Germaine, Mekaila, baby Ron, Austin, Larissa, William Jr., Rebecca, Karla, Tricia, Emma, Christopher; and her one and only great grandchild Harmony. She will be missed by her brother Lawrence (Stella) Buck and sister Yvette (Frances) Buck; her sisters & brothers in law Theresa Bahl, Cecilia Ross, Leona Lathlin, Edwin Jebb, Norman Jebb, Norma (Ray) McLean, Marie (Jerry) Jebb; brother in law Joe Knight; and all her nieces and nephews. In Heaven, she joins her parents Douglas and Flora Buck; herstep dad Elfie Fillion; her brothers Alan and Gordon Buck; her sister Thelma Knight; her grandchild Michael William Grey; her close friends Lorraine, Louis and George Shorting; and other relatives, too numerous to mention.